A first question that comes to mind is, how did these ‘Wise Men’ know about the birth of Jesus? What did they know about it? What does their visit mean for us today in the 21st century? Well for starters, let’s find out how they knew. Now, imagine you’re a ‘Wise man’ who not only got your life spared by a young Jewish kid, but also all of your family were spared as well. I imagine that would evoke a lot of loyalty towards someone like that. You would listen to this kid, even though he was Jewish and much younger than probably most of you were. Daniel through God’s grace and purpose, just saved a lot of lives. A common misconception perpetuated by Christmas cards is that there were three Wise Men on camels. Another misconception perpetuated by a lot of churches is that there were ‘more’ than three, but not a lot more. (6-8 maybe) I don’t think Herod nor all of Jerusalem would be startled by three (or 8) guys riding up on camels. I think (my opinion) is that these guys should up en masse, perhaps a caravan of a hundred to two hundred or more. Obviously, all of Jerusalem wouldn’t have been in King Herod’s castle, hearing the question asked about where the ‘King of the Jews’ was, so what startled them was to see such a large entourage of enemy Parthians showing up. Notice they are quoting Micah 5:2…or rather, misquoting it. Here is what the Prophet Micah actually stated. The high priests and scribes were scared of Herod, so they were tailoring their message to fit the audience. So we know from the start, who took the scriptures literally, and who didn’t. Thus far, we know why Parthian Wise Men would know about a Jewish Messiah in the first place. And we know how they knew where the Messiah was going to hail from. Well going back to Daniel, we know that he received from the Angel Gabriel, a prophecy concerning the future known commonly as ‘Daniel’s 70 Weeks’. From here they would have understood, that from the going forth of the commandment (Nehemiah 2) given by Persian (now Parthian) King Artaxerxes…when exactly that would have been. The question many would be asking themselves is, ‘yeah, but that would point them directly to Palm Sunday of AD33, not when He was born.’ I’m glad you asked. The Wise Men would have been exposed to the Jewish Scriptures (the OT) through Daniel, and it’s no stretch to imagine that He would have explained these to them and possibly, entrusted to them to continue watching long after he was gone for the coming Messiah. Not only that, but Daniel would have also explained, that Messiah would come in part as a Priest. (In order to fulfill Daniel 9:24). Furthermore, this is the cool part, they would have made a reasonable assumption, that according to the Scriptures (Numbers 4) a priest could not enter service until he was 30 years of age. So all they had to do, was calculate the 483 years from Daniel’s 70 Weeks prophecy, and then back that up thirty years, and they would be very close to the mark. Ok, so that gets them to the year maybe, but how would they know exactly when The One would be born. 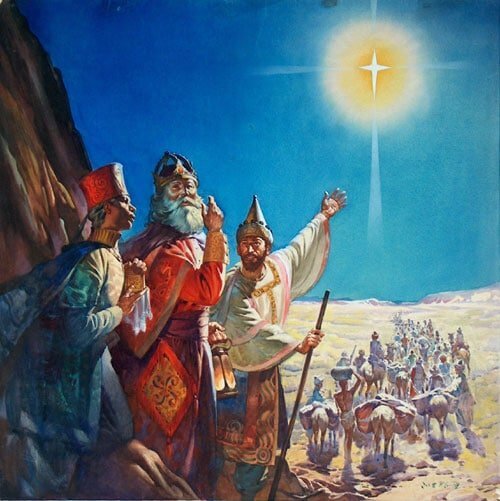 “We have seen His Star in the East, and have come to worship Him” the Wise Men told Herod. They knew, what the Scribes and Pharisees should have known. And they came bearing gifts not only fit for a King (Gold), but also for a Priest (Frankincense) because again, they studied the Old Testament. They also came bearing Myrrh, which was a sweet smelling spice you could apply to the dead as an act of honor. They knew this because in Daniel’s prophecy, that Messiah the Prince would be ‘cut off, but not for Himself’. And isn’t it just like God to bring in some Gentiles to be the first people in the New Testament, to come and worship the King of Kings? The Gospel of Matthew presents Jesus as the Lion of Judah, the rightful heir to the throne, and these Gentile ‘kingmakers’, came first (Law of First Mention) to demonstrate to the people in whom Jesus would offer His Kingdom too, He had arrived. Just thinking about that gives me goose bumps in how awesome our God is, and how detailed he is in setting about events, exactly as He wants them too. And although it is fascinating, I began to think back to Daniel’s interpretation of Nebuchadnezzar’s dream. We are now living in the days of a revived Roman empire (toes of iron mixed with miry clay). Although we have not seen it (or may not see it fully) materialize before the Rapture, we are the generation living in the shadow of Nebuchadnezzar’s multi-metallic statue. Just as precisely as God used those Wise Men to be the ones to worship Him at His first Coming, so too is the timing and event that would lead to Israel becoming a nation again in 1948. And wouldn’t you know it that exactly when Israel becomes a nation again after almost 2,000 years in Diaspora, so too is a final version of the revived Roman Empire appearing again, to rear its wicked head (1948).